Looking for the best facial cleansing brush? Here, we’re giving you 7 cleaning brushes to choose from. These are our top picks. Based on thorough research – which includes going through consumer reviews and feedback, and going through each of these brushes’ features – these 7 brands made the cut because of the following reasons. First, they made many consumers happy. Who’s better to tell you whether a product works or not? Of course, it’s the buyers who tried and tested the merchandise. These facial brushes have been generally given positive feedback from consumers. Of course, a few are not happy because the product doesn’t suit their expectations. For instance, they want a rotating brush head but didn’t know that what they bought is a sonic brush which vibrates instead. Let’s also note that there have been reports of users not satisfied with the results. Some hope to clear away their pimples, but they haven’t gotten the desired results. Second, most of these brushes come with claims that are backed by their own clinical studies. Examples of these brands include Clarisonic, Soniclear, and Olay. Last, let’s not forget the features. These products are well-made or have unique features that are truly useful to your cleansing regimen. Others have add-ons that are good for specific types of people. For instance, TOUCHBeauty has several small and lightweight brushes for travelers. Foreo Luna and Solo Mio are for people who don’t like replacing brush heads from time to time. And the Spa Sonic is ideal for people who want both a face and body cleanser. Clarisonic is the “mother of all skin cleansing systems.” They started the trend back in 2004, and since then, we saw a mushroom of facial brushes. Since it was first introduced, we saw Clarisonic improve in features. Today, there are at least 7 versions available for purchase today – Mia 1, Mia 2, Mia 3 or Aria, Mia Fit, Alpha Fit, SMART Profile, and Plus. Clarisonic facial brushes use brush heads that move through sonic technology. The bristles oscillate as they deep cleanse and get rid of your skin’s oil, dirt, and other unwanted particles. The result is smoother, softer, and clearer skin. When you unbox your package, you’ll get your Clarisonic facial cleansing brush, an inductive charger, a free cleanser, and extra brush heads. Also, depending on the model you’ve purchased, you’ll get a free accessory such as a storage case. Read our reviews and product reports on the Mia 1 and Mia 2 here. Of all the non-Clarisonic brands out there, it appears that the Soniclear is giving these other companies a run for their money to quickly becoming Clarisonic’s biggest rival. 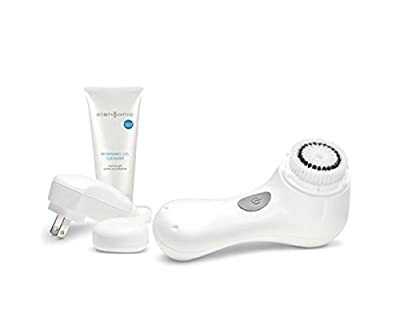 Clarisonic is of course in existence longer than Soniclear, but the latter has some impressive unique features in its arsenal. And it’s keeping up. 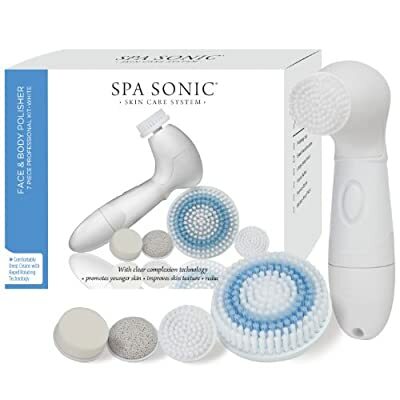 According to its official website, Soniclear is the world’s first facial brush to have an antimicrobial product protection feature. With this feature, there are two benefits that you can expect. One, your brush heads can last longer. Instead of 3 months, you can change your brush heads every after 6 months. Second, microbes that cause breakouts are eliminated. Everytime you glide your Soniclear over your face, you can be confident that it’ll help eliminate pimples and not cause them. Another feature that Soniclear face brushes have is C-Boost Collagen Technology. According to Michael Todd, this technology has been clinically proven to improve the appearance of fine lines by 84%, improve the skin’s firmness by 70%, and improve the skin’s texture by 91%. Soniclear brushes also come with an inductive charger. But unlike Clarisonic, the charging base also acts as a storage cradle. Instead of laying your Soniclear on your countertop, you can display it nicely. Read our comparison of the Soniclear and Clarisonic here. To cap, Soniclear offers a 3-year warranty for the Petite brush and a 5-year warranty for both the Elite and Elite Deluxe brushes. Unlike Clarisonic and Soniclear and many other bristled-type brands, the Foreo Luna is a silicone-based cleansing system. It still works through sonic technology, but instead of bristles, this device is equipped with silicone touch points that do the work. As advertised, the Luna can deliver up to 8,000 pulsations per minute and remove 99.5% of dirt and 98.5% of makeup. The Luna has two areas – the front and the back. The front part is called the “cleansing side,” which contains silicone touch points The back part is called the “anti-aging” side, which has ridges that can massage the muscles and stimulate the production of collagen. Bristle-type facial brushes usually have one or two settings. But with the Luna, you’ll get 8 speed options. On the device, there is a “+” and “-” signs that you can use to suit your preference. The Luna is already lightweight and compact. But if you’re a traveler who wants to pack a “barely-there” beauty tool, you might want to try the Foreo Luna Mini. If you’re a guy who doesn’t like the pink color, be happy to know that there is a black Luna intended for men. The Foreo Luna Mini is a Foreo Luna Mini dupe. This is on our list because it’s impossible to ignore the positive feedback and reviews from many buyers. Besides, we’ve already compared the two, and performance-wise, there’s not much difference. Also read our report on the Solo Mio here. TOUCHBeauty has a variety of brushes to choose from. So far, we’ve counted 11 facial brushes, but we wouldn’t be surprised if there are more. If you’re a traveler, there are small brushes that weigh only about 130 grams. It’s so small that you’ll definitely enjoy a hassle-free packing. There are also TOUCHBeauty brushes that come in a sturdy storage box for easy storage. To tell you about the features, let’s take the TOUCHBeauty TB-1487 as an example. This is a sonic brush that delivers up to 17,000 sonic vibrations per minute. It runs on 2 AAA batteries, has multiple speeds, and comes with a PBT brush head. Why get the ProX? The ProX is ideal for people who are looking for a cheaper alternative to the Clarisonic or Soniclear, and those that prefer a rotating brush head over a vibrating one. 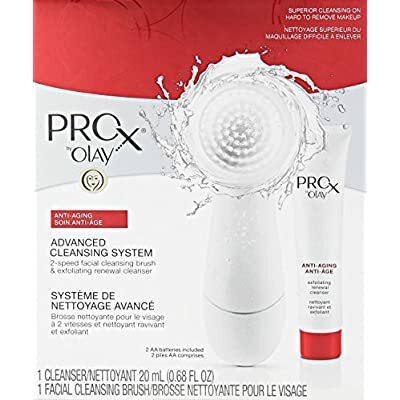 Aside from those, you might also be interested in the ProX because it has two speed settings – one speed option for your daily deep cleansing needs, and another for gentle exfoliation. It comes with a cleansing foam head that you can replace every after 3 months. Since it’s from Olay, expect that a team of dermatologists is involved in its creation. As advertised, this device is designed with the Global Derm Alliance, an alliance between Olay and a group of “world-renowned” experts. ProX and Clarisonic are the only brands that include free cleansers in your purchase. Read our full report on the ProX here. Spa Sonic is the only skin care system on this list to include two additional applicators that target other parts of your body. One is a large brush intended for the whole body, and another one is a pumice stone that works on hardened skin and calluses. In total, the Spa Sonic has 4 interchangeable brushes. As advertised, these brushes should give you a spa experience right at the confines of your home. Read our review of the Spa Sonic here. Best Face BrushBest Skin Cleansing SystemWhat is the Best Deep Cleansing Brush?